Traveling to a destination for the first time, we decided to make sure that a. )our hotel/room was spacious, b. )it had a tub, c.) had a pool among it's facilities, d.)had good reviews, e). accessible and f).was reasonably priced. 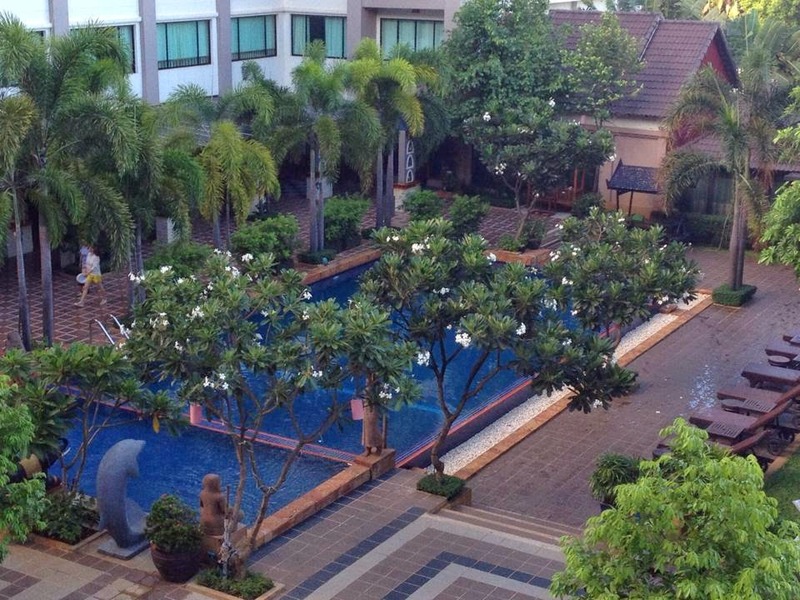 As always, we used Agoda.com to find a great place to stay in Siem Reap, Cambodia. Given that we were traveling during the off season, 4 - 5 star AFFORDABLE accommodations were abundantly available. Among the many options, we narrowed our choices to the top 3 contenders and picked : The Royal Empire Hotel. 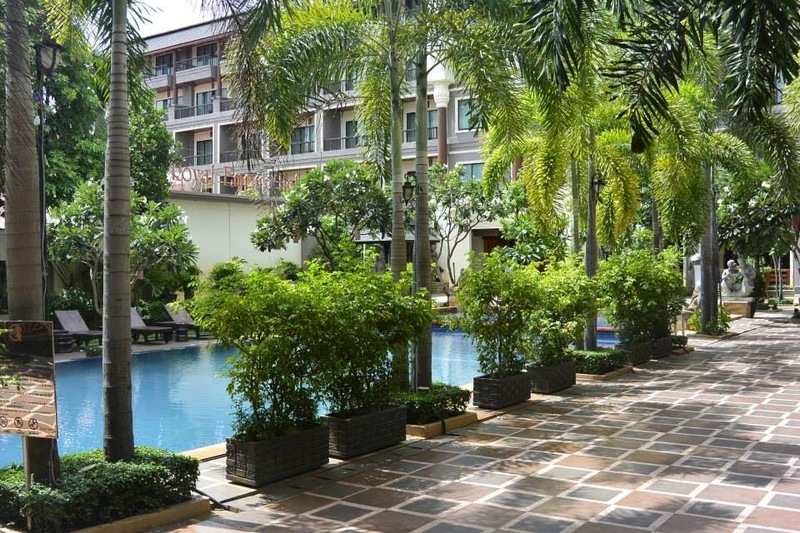 Conveniently located 5 minutes away from most of the known tourist destinations (Old Market, Pub Street, Night Market, Cambodian Cultural Village, National Museum etc), and 10 minutes away from the Siem Reap International Airport, the 222-roomed boutique hotel (air conditioned) boasted of a lovely Khmer hardwood interior and Khmer decor. We booked ourselves for a 6 night stay at The Royal Empire and was not disappointed. 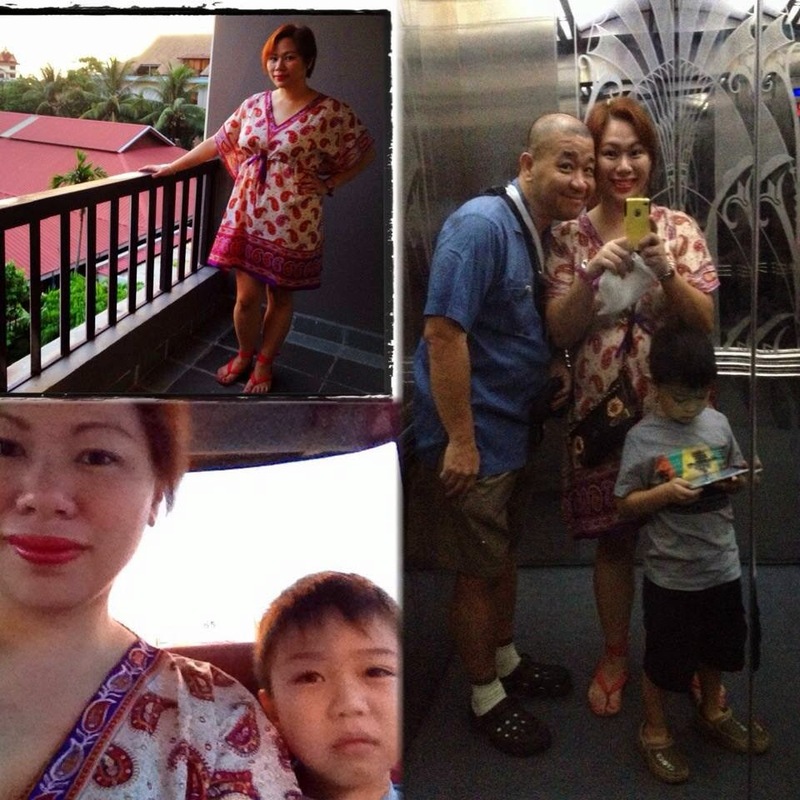 For starters, given the time we went to Cambodia, the rooms were at 70% off. Next, the hotel offered a free upgrade to our deluxe room booking, and gave us a premium room for our entire stay, together with a free dinner, on top of the free daily breakfast buffet. 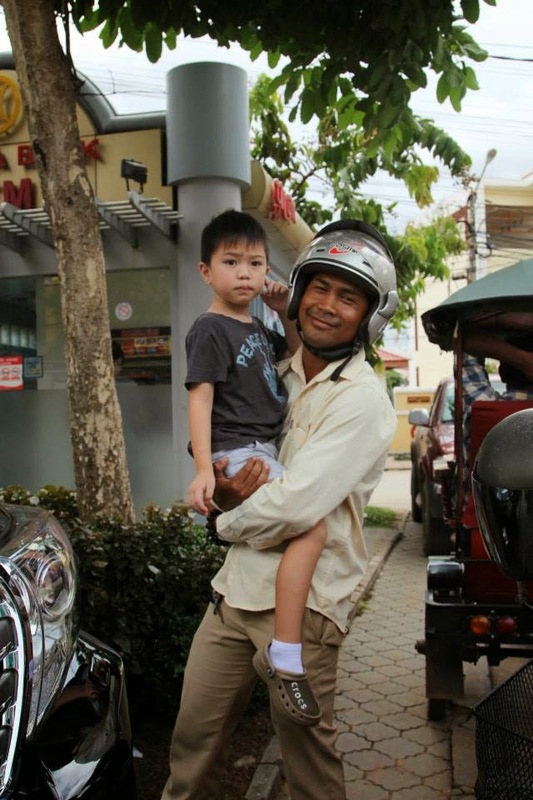 They also threw in free airport transfers. Talk about perks! This place had a lot of things thrown in to sweeten the deal. On the evening that we arrived at Siem Reap, true enough, a chauffeur holding a sign with Phil's name on it, awaited us at the front of the arrivals door at the airport. Mr. Bang, our English speaking driver, wasted no time in shuffling us off to the hotel's Toyota Camry. Driving to the hotel, he pointed to the places of interest, as we passed by them. In no time, we were at the hotel. Check in was quite fast and efficient. The usual showing of the Agoda voucher, passports and signing of the hotel registration, took less than 5 minutes. The free welcome drinks served weren't as needed, given the efficiency of the process. From the main building, we had to go outdoors and go for a short walk by the hotel's salt water pool, into our room's building. 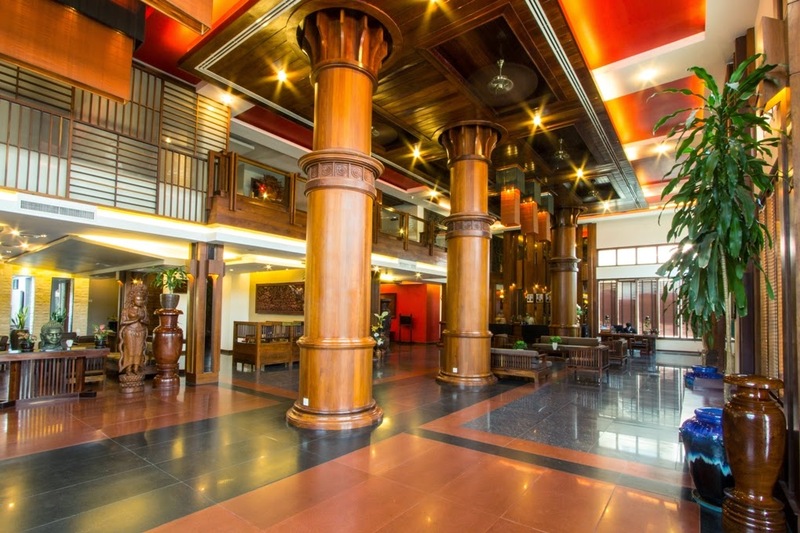 The Khmer hardwood decor and design was quite simple yet opulent. 2 floors up the non-smelly, new elevator, we were brought to our home for the next 6 nights and 5 days. As with the rest of the hotel (I cannot stop raving over the hardwood), a well cleaned, polished, comfortable bed room greeted us. The king sized was firm, not hard, we had enough pillows for the 3 of us, that weren't lumpy, and the duvet and sheets smelled and looked clean (yes, I can be that meticulous :P). Our room had a balcony with a nice view of the pool. Once the doors are closed, you couldn't hear any noise from the outside. My only gripe about the balcony area is that a. the locks are flimsy, so any toddler or kid could unlock this if you're currently busy and b. there was a bit of oxidation on some parts of the metal railing of the balcony (probably from a leaky aircon, upstairs or something). Cable TV was available and had a good selection of programs in a variety of languages. The room also had a mini bar/fridge, and a good sized closet (where your bathrobes and slippers are stored) and furniture to use for the duration of your stay. The bathroom was clean, spacious, had non slip tiles, a shower/tub and a separate rain dome shower area. The toilet though had a leaky bidet. Other than that, the hairdryer, toiletries (replaced everyday) and towels (replaced everyday too) were all A-plus. 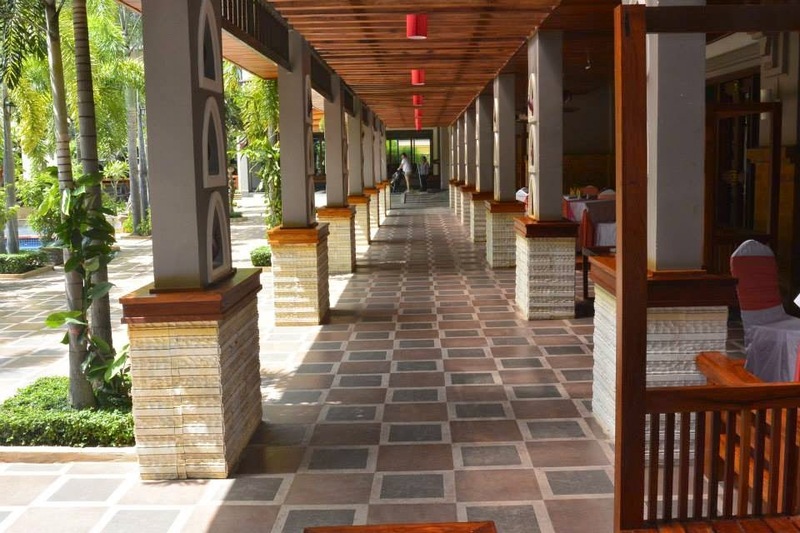 The hotel itself also has a spa, a fitness center, 2 gift shops, tuktuks for hire (public transportation, exclusive to hotel guests), an outdoor salt water pool (with a kiddie pool on top of the adult pool) and it's own restaurant. 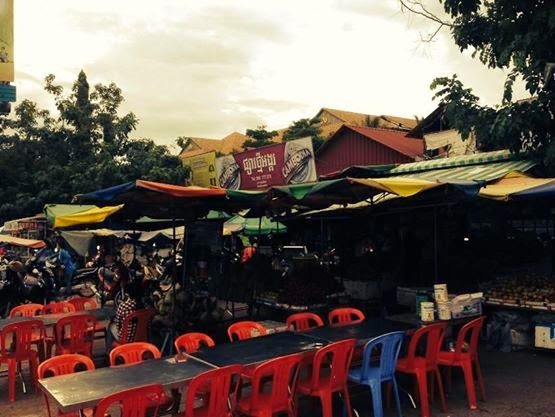 As with the rest of Siem Reap, food can be quite pricey. The hotel's Emerald Restaurant offered Western, Asian and Khmer dishes, not less than $6 (USD). The authentic Khmer food we partook in was quite so-so. Beef slices were a bit tough, presentation was beautiful and taste, unique to the place. MAX loved the veggie spring rolls. Western: various breads, jams, spreads and butter. Sausages, ham, pancakes, french toast, assorted cereals and different pasta dishes. Asian: congee, fried noodles, steamed and various fried rice and noodles in broth. Vegetarian: lots of vegetables, salad dressings and fruits from the region (bananas, papaya, watermelon etc). Kimchi is also a staple, given the volume of Koreans coming their way. There's also an egg station on top of the noodle soup, congee, cereal, and salad station. Brewed coffee, 2 kinds of fruit juices and water are your available beverages of choice. Best tip if you stay there: Look for Mr. Sokkol. Best.Guest.Relations.Personnel.EVER! Of course, the rest of the team were all stars in their own right. 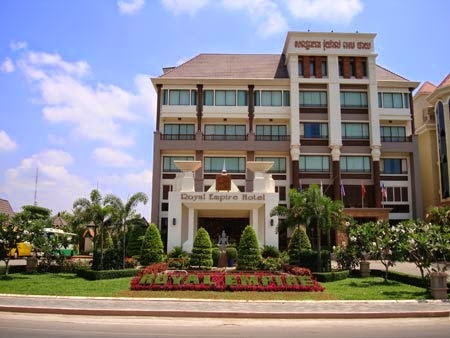 From the efficient cleaning staff, to our Spanish speaking Khmer bellboy, we looove The Royal Empire. BTW, should you need late night snackage or toiletries, there's a convenience store right beside the hotel, and a small market (Phsar Samaki) beside that store. 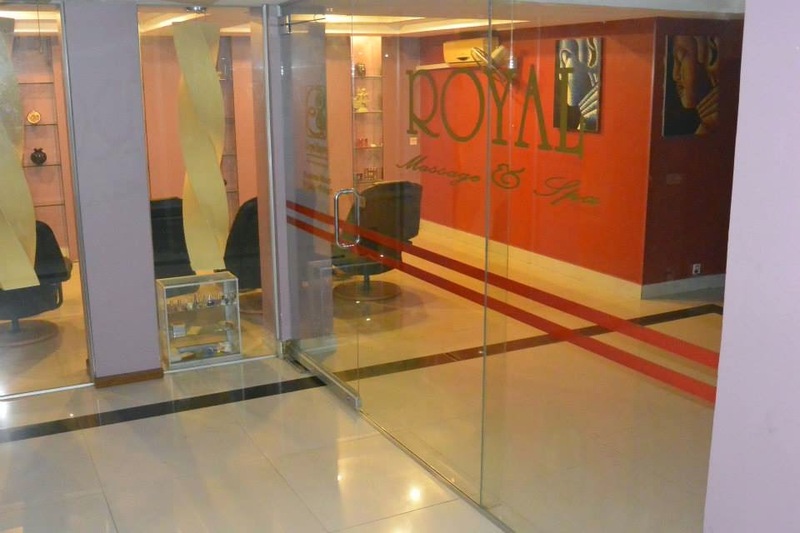 For more information about the Royal Empire Hotel, visit their website at this link. See That? It's SEE-uhm REE-ahp!